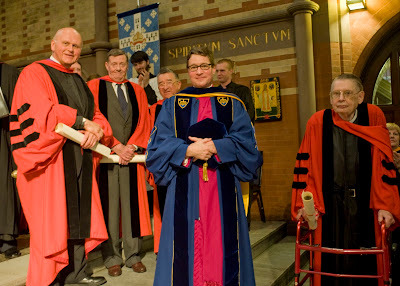 Anglican Mainstream South Africa » Blog Archive » Sue Christians, Get a GTS Doctorate. Sue Christians, Get a GTS Doctorate. There is certainly much to digest from General Convention, and before I do so I want to spend a post or two laying out my approach to these issues from an Evangelical Catholic perspective. While I am working on that, I’d like to share a wee bit of news and commentary that to my shock hasn’t appeared anywhere in the Anglican blogosphere. This will show just one of the symptoms of the underlying problems in our beloved Episcopal Church. But first, the usual disclaimer: I am a priest of the Diocese of Dallas, which is a part of The Episcopal Church. I have not left TEC, and I do not advise others to do so. However, I do regard those who have left as faithful Anglicans, and most importantly my brothers and sisters in Christ. And of course, these opinions are mine alone, and do not necessarily represent the opinions of the Diocese of Dallas, our Title IV Intake Officer, or Mickey Mouse. Now then, onto it. Let me be clear, I’m not bashing Mr. Beers. He is a lawyer, and lawyers rightly provide counsel to those who wish to employ their services. Lawyers provide a necessary service, regardless of the guilt or innocence of their clients. No one should judge a lawyer poorly because he or she is willing to represent people who are doing fundamentally unchristian things. However, I do judge that this action by one of our seminaries is incredibly shameful. Even if one believes it is proper to sue Christians who cannot in good conscience stay in The Episcopal Church, this sort of behavior should embarrass us all. If one thinks we should sue other Christians, one ought to at least have the decency to recognize it for what it is: a scandal against the whole Church (and I mean the Church Catholic, not just our tiny portion of it), demonstrative of an obsession with money and possessions, and a power play by those in power to impose their will on “those meddlesome traditionalists.” Suing other Christians is the kind of stuff for smoky back rooms and dark alleys, not something to be honored in the light of day. It is certainly not something to be held up as an example to the whole Church, including in the giving of honorary degrees. Am I the only one who wonders what the state of Anglicanism in North America would look like if even whole dioceses weren’t afraid of litigation and loss of property for which they and there forebears paid? If the fear of losing property is the only thing holding us together, Lord have mercy upon us all. I remember Bishop Lawrence of South Carolina, saying that he never felt more like the Bishop of his people than he did on the day he issued quit-claim deeds to every parish in the diocese (with apologies to +Lawrence, I think that’s reasonably close, but I couldn’t find the link to the original). His point, as I read it, was that his episcopal relationship with his people was stronger, not weaker, once the fear of litigation and loss of property had been removed. I think the good bishop hit the nail on the head: that which ought to bind us together had better be stronger than the fear of losing one’s property. If lawsuits and fear are what is holding us together, maybe it would be better if we splintered into oblivion. Of course, I think there are many other things that can help hold The Episcopal Church together, including our Catholic heritage (if we will recover it), our shared worship (admittedly less common than the BCP once was), and the unique gift we have of offering sacramental worship within a portion of the church that was at least imagined to provide more comprehensiveness than either Rome or the East, the via media. It is difficult, however, to see all of the good and potential good that remains, when the general church is leading a legal effort to drag other Christians into court to recover “their” property. How disingenuous does one need to be to seriously suggest that the 1,000 or so Fort Worth Episcopalians who remained in The Episcopal Church after their diocese (under +Iker) left TEC in 2008 could ever hope to sustain every parish, every piece of property in that diocese? Further, how disingenuous must one be to observe well over 90% of a parish leaving, and then to suggest that the 90+% are just individuals, and the tiny few that remain are the parish? We need to find equitable solutions to parishes, and even dioceses choosing to depart TEC. We need to part graciously so that all involved can be equipped for the ministry to which they are called. And we certainly do not need to be awarding honorary seminary doctorates on the basis of suing other Christians. Given the circus those around us see when looking at our beloved and embattled Episcopal Church, it comes as no surprise that we are not filling our pews, not bringing the lost into the presence of Christ, and failing to be a good witness to the world around us. Lord have mercy, indeed. There will be more to follow in the coming days and weeks, as we strive with one another in charity and honesty. In all things, we ought to be continually in prayer for our parishes, dioceses, general church, and Anglican Communion, and especially for those with whom we most vehemently disagree. We will always have trouble in the Church, but let us pray that we will rebuild an Episcopal Church in which such shameful action as suing other Christians does not seem to merit a doctorate. This entry was posted on Thursday, July 19th, 2012 at 12:05 pm	and is filed under Uncategorized. You can follow any responses to this entry through the RSS 2.0 feed. You can leave a response, or trackback from your own site.